Simon Says It must Be Love! My card is pretty looking valentines card. Not the typical traditional valentine card. 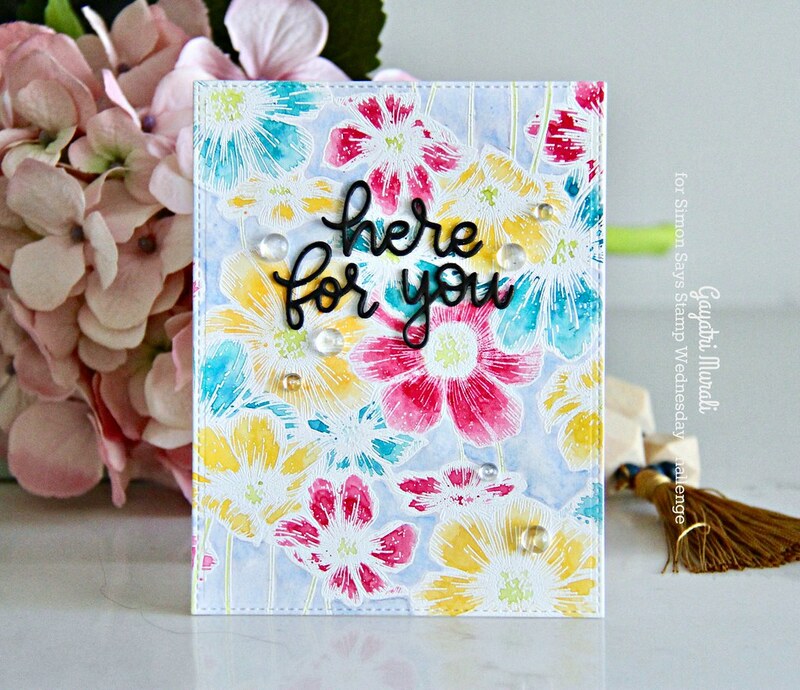 I love the Cosmos background stamp from Simon Says Stamp Love release collection. Great to colour in what ever medium you want to. I used Daniel Smith watercolour dot palette to colour mine. 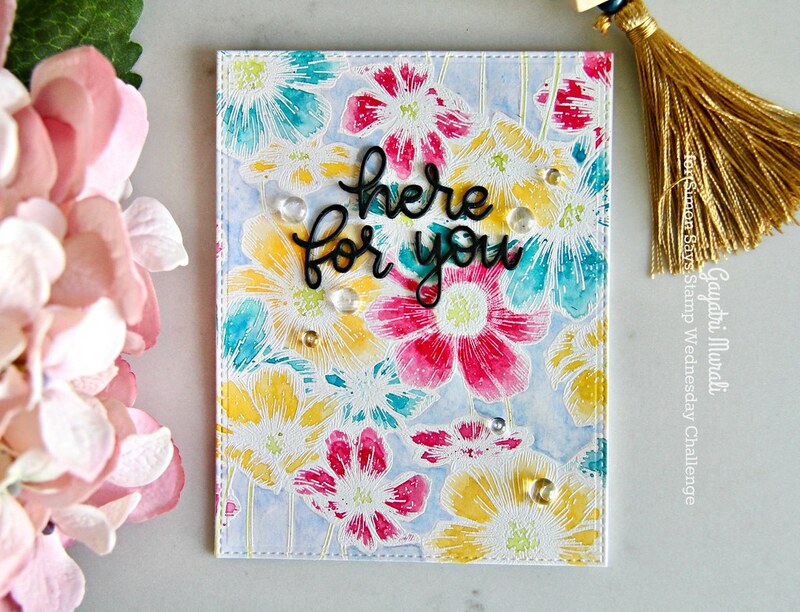 This card is simple to make. I stamped the background on a large piece of Bristol paper and white heat embossed the whole image. Then used the Daniel Smith Dot palette to colour the image. I love these dot palettes. They are cheap and great to try out before you make the decision to buy what colours you want to make your own palette. 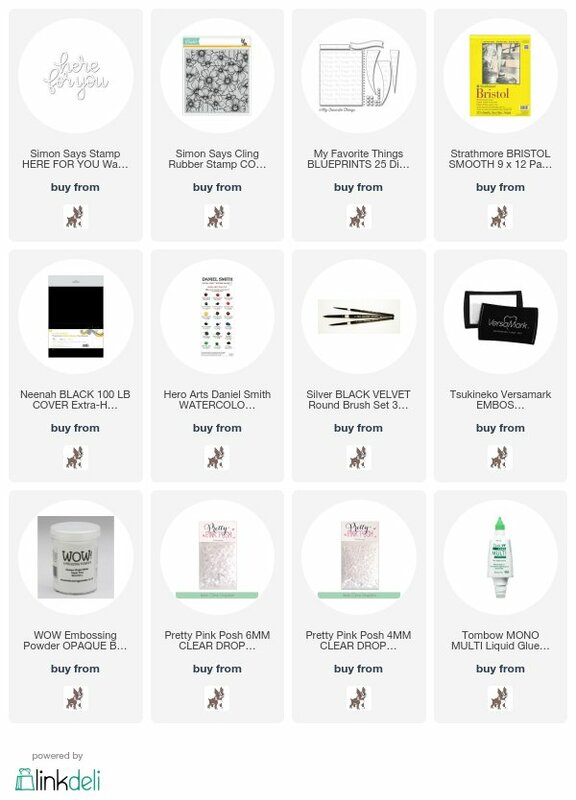 I used the Hero Arts palette as the rest were sold out. I will be getting the others as well especially Yana’s and Debby’s palette. Anyway, after colouring the image, I die cut using the stitched rectangle die from one of the MFT Blueprint die set. I adhered this panel on the card base. 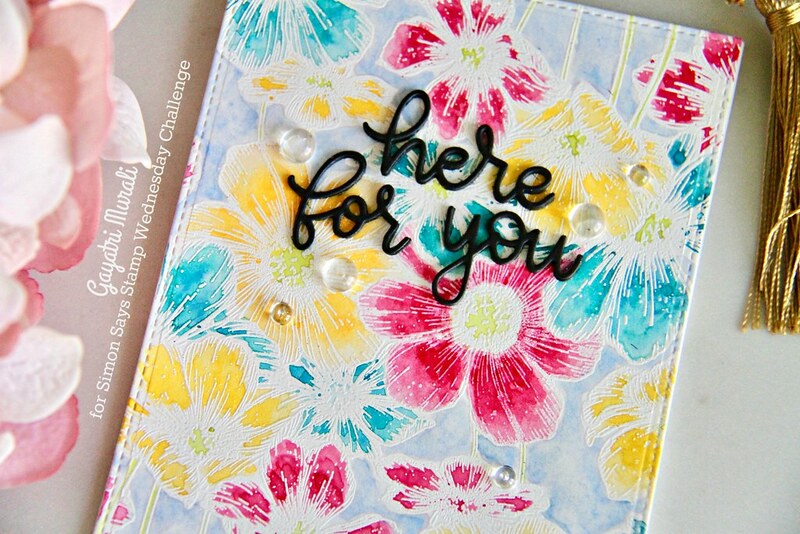 The sentiment is also from Simon Says Stamp Love collection called Here For You die. I die cut a few of them using black cardstock, stcked and glued them together and adhered on the top centre of the panel. Finally embellished with clear droplets from Pretty Pink Posh. I love how the Daniel Smith watercolour layers and blends with water, no grainy texture, highly pigmented. I love it. I think I have start my own palette soon. Here is another look at the card. 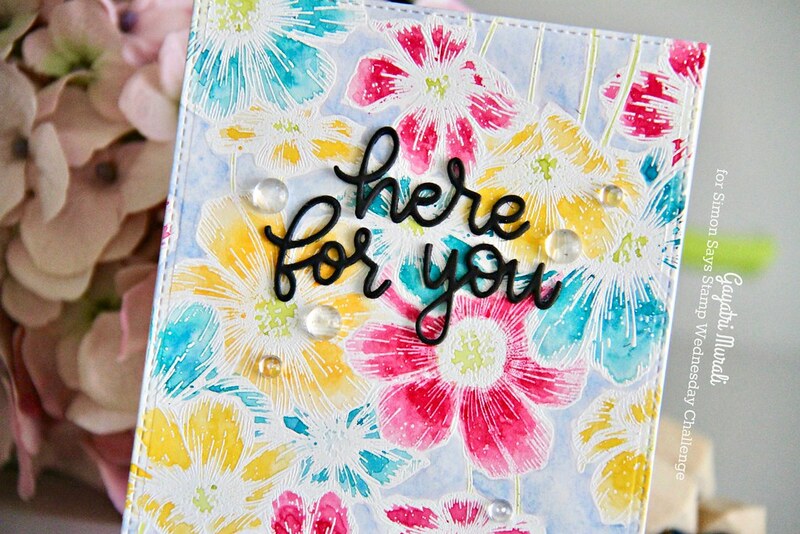 All the supplies used to make this card are listed below for you. So now it’s YOUR turn to take out your crafty supplies and join in! If you like to bookmark my card, here is the pin image. Thanks so much for stopping by. See you soon for with another post. 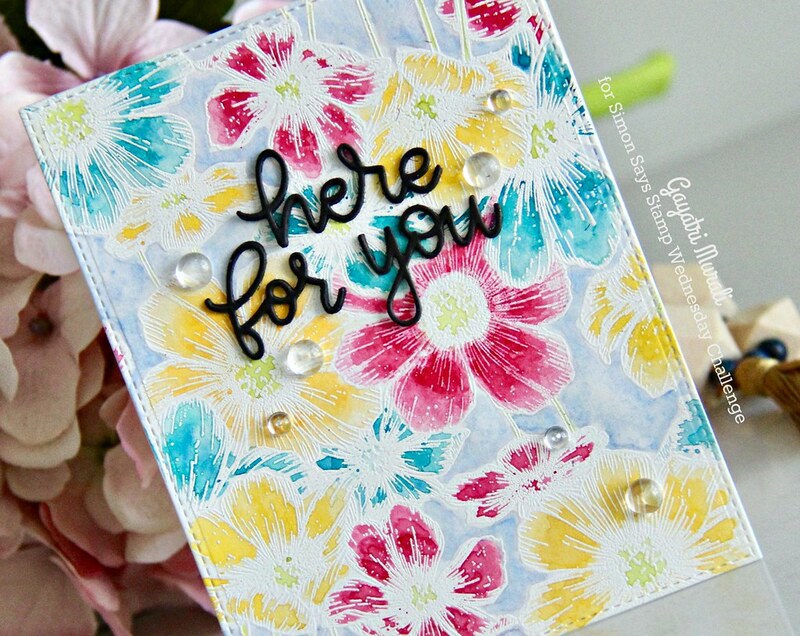 I love this pretty and colorful card! GAH-ORGEOUS background! I love how you colored with primary colors!! Stunning design!